He has been a practicing Veterinarian for 5 years. He has done MVSc in veterinary medicine. My pet's condition improved a lot after I consulted Dr Kumar.God bless him. 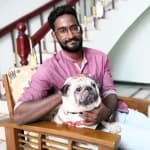 Best services in Pondicherry who loves animals a lot. I have a germen sperherd of age 3 years. He got wounds by another dog below the eyes. When I apply ointment on the wounds he nail down the wounds. Please suggest some oral or injection for this. Well, I think its better you send a picture of the wound, so that I can come to an accurate diagnosis that what is the depth of the wound, stage and infection and which medicine can heal it sooner as possible. Thank u. मेरे पास दो छोटे पप्पी थे 13-14 दिन पहले लाये थे अचानक से एक पप्पी दूसरे को काटने खरोंचने लगा. मैं उन्हें लाने के 7 दिन बाद से ही एन्टी रेबीज अभ्यारब वैक्सीन ले रहा था. इससे पहले भी महीना भर पहले एंटी रेबीज वैक्सीन लिया था बिल्ली के खरोंचने की वजह से!अब चूंकि एक पप्पी (कुत्ते का बच्चा) मर गया है शायद रेबीज के सीनटम के साथ!मैं अंडर वैक्सीन कोर्स में हूँ!सेफ है न सबकुछ sir? actually dog or cat bite only needs post bite rabies injection , for nail scratches TT injection is enough. I will take my dog from Assam to Kolkata via air India flight. My dog is restless and is trying to break the box. What shall I do for keeping him quiet for 5 hours? You can give avomin tablet to your dog. It not only sedate your dog a little bit, but also act as anti emetic. I am having a pug dog. He is going to be 5 years in coming April. Recently he got wounds on his body so we got his tests done. As per them his Globulin- 5, normal- 3.7 neutrophil count - 86, normal- 76 total leucocyte count- 35, normal- 17 please suggest whether its something serious & precautions we need to take. As per what I know Normal globulin levels - 1.6 to 3.6 g/dl (3.7) Neutrophils count - 60 to 70 % (86) Total leucocyte count - 4 to 15.5 (35) Here leucocyte and Neutrophils count may have been little higher becoz of wound. Nothing to worry as per the blood results. Hi, My dog is very lazy and not energetic at all can any one suggest any medicine to make him aggressive. Hi, Actually no medications can bring it to active expect u, you r the medicine, just spend more time with it and play with it a lot. I think you r not spending time with it and no one is there around the dog and it's all alone in home, becoz of it slowly its behaviour would have changed. Can you kindly mention its age and breed. Thank You.